Did you know that yoga is good for both of your hearts? I bet you never thought of yourself as having two, (I say it a little tongue-in-cheek) but I’m talking about not only the hardworking, blood-pumping organ in your chest, but also the emotional heart we refer to when we talk of love, compassion, heartache and heartbreak. The capable hands of a surgeon can fix the heart organ, but the metaphysical heart can be a little trickier to mend. Yoga helps us to heal and strengthen the heart, in both the physical and the metaphysical sense. From a physiological standpoint, yoga helps decrease cardiovascular risk factors such as high cholesterol levels, triglyceride levels, and blood sugar levels. It supports regular heart rhythms, and improves the circulatory and respiratory systems. Yoga strengthens and tones the muscles, and generally helps you maintain a healthy body weight. A regular practitioner will usually come into healthier eating habits as well, as they incorporate what they’ve learned about balance and body awareness on the mat into their everyday lives. Yoga also helps relieve stress and anxiety, and we know that chronic stress wreaks havoc on the body. Making matters worse, in our attempt to de-stress we often engage in unhealthy habits such as smoking, drinking alcohol, and eating junk food. These activities lead to high blood pressure and high cholesterol, and only numb the stress temporarily. On the emotional side, yoga supports a healthy, open heart. In life we go through many things: loss, heartbreak, betrayal- a wide array of emotional hurts. Over time, these experiences cause us to put up little walls around our hearts. We believe that if we can just protect our hearts behind these walls, that we will avoid getting hurt, so we slowly begin to close off, adding layer upon layer over our vulnerable hearts. The heart chakra (one of the major energy centers in the body located at the center of the chest) then becomes closed. The heart chakra is related to our ability to give and receive love. When it is closed or imbalanced, we find it difficult to feel love, compassion, grace, and peace. We may instead feel anger, grief, and bitterness. Additionally, this imbalance can manifest in a variety of physical ailments such as lung problems, breast cancer, a compromised immune system, and blood diseases. If you have ever read about healing the body by healing the mind, you know that holding onto negative beliefs and thought patterns causes disease within the physical body. If we can address the emotional blockages, we can heal the body more effectively. Begin on your knees with your legs hip-width apart. Place your palms on your sacrum. Without compressing your lower back, lean back into the support of your hands. If you have the mobility, move into the full pose by reaching your hands to your heels. Think about reaching the center of your chest toward the sky. Bring the hips forward to line up over the knees and reach the tailbone down. Keep the chin drawn toward the chest, or let the head hang back if it feels okay for your neck. Remain in the pose for a few deep breaths. Release by engaging through your abdominals to bring your body gently back to a kneeling position, then sit back on the heels for a few breaths in Balasana (Child’s Pose). Begin in Downward Facing Dog. Inhale the right leg up, bend the knee and open the hip. As you transfer your weight into your left hand, and the pinky toe side of the left foot, continue to reach the right foot behind you until the ball of the foot comes to the earth. Lift your hips up and open the center of your chest toward the sky. Reach the right arm up and open the chest a little more, coming into a deep back bend. Stay here for a few breaths. To transition out of the pose, engage the abdominals and gently make your way back into a Downward Facing Dog. Repeat on the other side. *This is a more intermediate pose, and being a deep back bend, it is a good idea to warm the body with a few Sun Salutations and some mild backbends before attempting it. 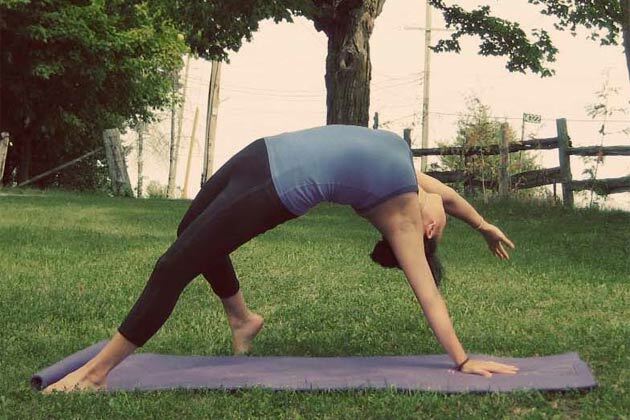 Give these yoga poses a try, and feel the difference in both your heart and your heart chakra!